CarGurus has 15,953 nationwide Q5 listings starting at $6,495. An ultra-high-end cabin with loads of standard features, not to mention some heady driving characteristics, class-topping mileage numbers in the 4-cylinder versions and a handsome profile, all add to the appeal of Audi’s 2012 Q5 pint-size luxury crossover. Class-lagging cargo space, some unseemly wind noise, a frustrating media interface system and a premium price are once more among the 2012 Q5 compact ute’s drawbacks. Downsizing Audi’s popular Q7 midsize crossover has resulted in the eminently drivable 2012 Q5 compact crossover. Combining a bit of utility with a lot of luxury, an efficient turbocharged 4-cylinder engine or a no-nonsense V6 powerplant, as well as a handsome look and standard all-wheel drive, the Q5 lineup ought to be the perfect size for small families with a yen for opulent commuting or empty-nesters feeling the pull of the open road. Just be aware that all this panache has a pretty hefty price. Historically a battler in the luxury compact crossover bottom-line wars, Audi’s 2012 Q5 lineup offers an efficient turbocharged 4-cylinder or a normally aspirated V6 powerplant, all-wheel drive and a plethora of posh. Loosely based on the popular Audi A4 sedan, this 5-seat compact mini-ute also shows some sporty élan on the low road, while tickling one’s fancy for speed on the highway. And all of this with a ride that would make all but that pea-prodded princess prattle with praise. Again, the elegant Q5 is available in 4 trims, the base 2.0T Quattro Premium is followed in ascending order of plush by the lower-midlevel 2.0T Quattro Premium Plus, the amped-up 3.2 Quattro Premium Plus, and the flagship 3.2 Quattro Prestige. In traditional fashion, Audi labels the various Q5 trims by engine size, while the Quattro designation indicates those trims featuring this classy conveyance’s full-time all-wheel-drive (AWD) capability. Few changes have been made to the 2012 edition of this cute ute, though an S-Line Plus Package is available to the higher trims and offers embossed S-Line leather upholstery, paddle shifters, upgraded wheels and interior trim, a sport steering wheel and performance tires. Additionally, Audi’s Multi Media Interface (MMI) system has been given a few tweaks for this year. Thus we can look for this compact crossover to retain the distinctive styling, quiet comfort and dignified demeanor that have made it a best-seller for going on 4 years now. Lest there be any confusion, this 5-passenger compact crossover is a far cry from those truck-like monsters that’ll carry tons of cargo over treacherous mountain trails. Its 57.7 cubic feet of total cargo area with the rear seats folded is less than that found in many rivals, as is its quasi-paltry 29.1 cubic feet that ends at the rear seatbacks. Of course, the standard fold-flat front passenger seat might marginally alleviate this dearth of carrying capacity, and it’s doubtless fair to say that delivery dons won’t want to spend the money for a luxury-laden donkey cart anyhow. And be aware that the full-time AWD (Quattro) system is useful in snow and mud, not for blazing trails through tattered terrain. 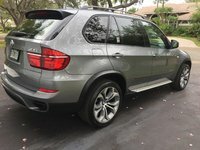 In any case, before settling on this audacious Audi, luxury-oriented tire-kickers may want to take a look at BMW’s X3 with its available 300-hp V6 engine and track-ready performance. Or if budget constraints rear their ugly heads, Cadillac’s SRX or Audi’s RDX might be worthy of consideration. If looks matter in making a deal, Range Rover’s exotic Evoque is a head-turner, while Volvo’s XC60 offers what many in the know consider a friendlier luxury crossover for the plus-size family. For 2012 Q5 2.0T trims, a 2.0-liter turbocharged inline 4-cylinder (I4) engine mates with the standard 8-speed shiftable automatic transmission for 211 hp at 4,300 rpm and 258 lb-ft of torque at 1,500 rpm. Mileage with this blown four-banger is estimated at a pretty respectable 20 mpg city/27 highway, while towing capacity is maxed out at 4,400 pounds with the proper equipment. 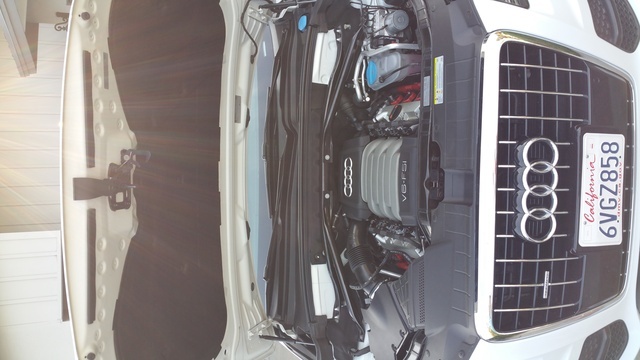 Driving the Q5 3.2 trims is a 3.2-liter normally aspirated V6 powerplant that remains under the management of a 6-speed shiftable automatic transmission. Look for 270 hp at 6,500 rpm and 243 lb-ft of torque at 3,000 rpm from the non-turbo V6, with mileage estimates dropping a bit to 18/23. And once again, maximum towing capacity is 4,400 pounds when properly equipped. Audi’s Quattro (AWD) system, meantime, maintains a 50/50 torque split to all 4 wheels in normal driving conditions, with power distributed from front to rear axles and back for distinctly delightful handling. When things get slippery, the Quattro technology automatically and instantaneously transfers power from the wheels that slip to the wheels that grip for a confident trip through treacherous weather. Tests of the blown 2.0-liter I4 had it averaging 6.8 seconds from 0-60 mph. The 3.2 V6, on the other hand, averaged 7.0 seconds for the same journey. Audi, on the other hand, claims the 3.2-liter V6 will handle the 0-60 straight-line in 6.7 seconds. In any case, more than a few reviews question the wisdom of trundling along in the more expensive V6-laden edition when the economical turbocharged 2.0-liter versions do at least as well, acceleration-wise. Almost all professional reviewers note that both engines perform admirably in most ordinary driving situations, though a few note a bit of turbo lag from the blown I4. Once it gets going, however, this turbocharged four-banger shows fine overall power, according to reviewers. It should be noted, however, that at least one review mentions a tendency in the smaller engine to labor a bit on steep hills. Meanwhile, reviewers are generous in their praise of both automatic transmissions, noting both to be smooth and responsive. And finally, reviewers laud the throaty growl of the V6 on hard acceleration, while the turbocharged I4 is described as noticeably less refined. Both do, however, quiet down nicely at highway speeds. Again for 2012 Audi’s Q5 lineup rides on a 4-wheel independent suspension that boasts a multi-link front and rear system and stabilizer bars fore and aft. The 2.0T Quattro trims each sport 18-inch alloy wheels, with the 3.2 editions rolling on 19-inch alloy wheels. All trims mount all-season tires, standard, with the available S-Line Plus Package offering summer-oriented performance tires. Ride comfort in all Q5 trims is noted by reviewers to be better than merely adequate, with most small and medium-size bumps well-damped. A number of reviews note that this little crossover rides a bit more stiffly than many of its rivals, but that passenger comfort is never compromised. Steering characteristics in all Q5 trims are noted by reviewers to be well-balanced and confident, leading to what many call one of the more exhilarating and entertaining driving experiences in the compact crossover class. Body lean in tight corners, meantime, is described as all but non-existent, and a rather compact turning radius should lead to less stress in taking on crowded spaces. Additionally, Audi offers the available Drive Select feature on the Q5 3.2 Quattro Prestige. This unique system can be set for altered throttle, transmission, stability control and suspension response in Comfort, Auto, Dynamic and Individual modes. Obviously, selecting the Comfort Mode will result in a more touring-oriented drive, while the Dynamic mode adds some panache to the ride. The Auto setting, meanwhile, is the default mode, while the Individual mode can be used to adjust individual settings, like throttle response or suspension/steering response to particular needs. A few reviewers note that the Drive Select system seems to be overkill for an already well-tuned drivetrain/suspension system, but a number of owners note that they are very happy with this driver-selectable performance option. Lastly, brakes are noted by all reviewers to be powerful and true with no pedal anomalies. Tests found, surprisingly, that the marginally heavier 3.2 Quattro trims come to a stop from 60 mph in 112 feet, while the lighter 2.0T trims take 199 feet to come to a stop. The difference is obviously in brake size, with the 3.2 Quattro trims boasting larger (by some 1.5 inches) front and rear disc brakes. Again in 2012 the elegance-flaunting Q5 lineup piles on the standard goodies. The entry-level 2.0T Quattro Premium, for instance, is delivered with a roof rack, leather upholstery, height- and power-adjustable front seats, reclining and sliding rear seats, a fold-flat front passenger seatback, remote power door locks, power windows and heated power-adjustable mirrors. Of course, cruise control and telescoping tilt-wheel steering are standard in this entry-level edition, as is tri-zone auto climate control. Cabin bling includes a leather-wrapped steering wheel mounting redundant audio controls as well as wood, leather and alloy cabin accents. Meantime entertainment is provided by a 180-watt system boasting an MP3-capable single-CD player, 10 speakers and satellite radio, all monitored by Audi’s allegedly tweaked Multi Media Interface (MMI) technology. Moving up to the 2.0T Quattro Premium Plus, you’ll find extras like a power rear liftgate, power-folding and auto-dimming outside mirrors, and an auto-dimming inside rear-view mirror. The 3.2 Quattro Premium Plus tacks on standard headlight washers, a power sunroof, keyless entry and ignition, and S-Line exterior trim accents, while the top-shelf 3.2 Quattro Prestige boasts adaptive xenon headlights, a blind-spot warning system, a 14-speaker Bang & Olufsen premium sound system, rear-door sunshades and an MMI-interfaced navigation system with rear-view camera that’s optional for lower trims. Standalone options for this luxury-oriented crossover include a power sunroof in the 2.0T trims, along with step running boards and upgraded wheels (19-inch on 2.0T editions and 20-inch on 3.2 iterations). Both the 3.2 Quattro Premium Plus and Prestige remain eligible for the new S-Line Plus Package with performance tires, a sport steering wheel mounting paddle shifters, upgraded S-Line leather upholstery and brushed aluminum interior trim. Both 3.2 trims can also be delivered with the available Audi Drive Select system, while the 3.2 Quattro Prestige is additionally eligible for an Adaptive Cruise Control package and the Luxury Package, flaunting ventilated front seats and upgraded leather upholstery. Roomy, feature-rich, comfortable and quiet are all words used by reviewers to describe the 2012 Q5’s interior spaces. The reclining rear seats are noted by reviewers to result in a more spacious rear seat than is common to the class, while the leather upholstery, wood and alloy trim pieces, supportive seats and wide doors all gain kudos for adding to this cute crossover’s appeal. Controls, meantime, are noted to be fairly simple to maneuver without the MMI navigation system cluttering things up, and gauges are described as large and easily readable. Reviewers again express disappointment that the MMI system remains a confusing mish-mash of buttons and glitches despite its latest upgrades, while cabin storage remains only average, and cargo area still lingers near the bottom of the class. Noteworthy standard safety features aboard all Q5 editions include 4-wheel antilock brakes with electronic brakeforce distribution and emergency braking assist, along with traction and stability control. Dual front side-mounted airbags, front and rear head airbags again come standard, as does front head-restraint whiplash protection, along with daytime running lights, front fog driving lights, turn-signal-integrated mirrors, a post-collision safety system and a remote antitheft alarm. The Insurance Institute for Highway Safety (IIHS) gives Audi’s luxury mini-ute its Top Safety Pick nod for 2012 while giving it a highest rating of Good in all tested criteria. The National Highway Transportation Safety Administration (NHTSA), meantime, has tested only the 2012 Q5’s rollover protection, for which it awards its second-best 4 stars. Among the more common owner complaints about Audi’s 2012 Q5 lineup is the fact that the multi-spoke alloy wheels are continually draped in brake dust and require almost constant cleaning. Suggested remedies run from upgraded brake pads to mounting a different style of wheel but, alas, the problem continues. Additional owner gripes include frustrations with the glitch-laden MMI system as well as things like the less-than-capacious cargo area, tepid cabin storage and an awkwardly situated headlight switch. On the plus side, owners are effusive in their praise for the Q5’s heady performance and handling attributes, with its beneficent ride noted by many as a welcome bonus. Surprisingly, despite some reservations by professional reviewers, most owners that choose to include the available Drive Select system are extremely pleased with its nearly seamless operation in adding to the Q5’s overall driving experience. Finally, the handsome profile, welcoming cabin and those respectable mileage numbers from the turbocharged I4 all gain kudos from appreciative owners. What's your take on the 2012 Audi Q5? Have you driven a 2012 Audi Q5? I Have A P0016 Code And My Q5 Will Not Start? Does a failing fan for the AC have anything to do with an easy fix like a fuse?